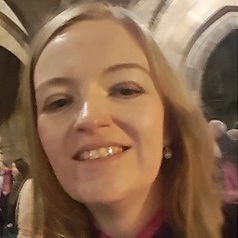 Clare Frances joined Edinburgh Napier University as a lecturer in law in January 2016, having worked previously at Abertay University. She teaches courses on EU law, public international law and employment law. Her research interests are in the areas of international criminal law and international humanitarian law, with a focus on international legal theory. Clare Frances studied law at Edinburgh Napier and Edinburgh, and completed a PhD in international criminal law under the supervision of Professors Christian Tams and Robin Geiss at the University of Glasgow in 2015. Her work has been funded by the Clark Foundation in Legal Education, the Carnegie Trust for the Universities of Scotland, the iCourts Centre for Excellence at the University of Copenhagen and the International Law Fund, and has been published by the Yearbook of International Humanitarian Law and the Global Journal of Comparative Law, among others. She has also blogged at Opinio Juris. She has previously been the holder of a scholarship and attendee at the Hague Academy of International Law and a visiting researcher at the Max Planck Institute for Foreign and International Criminal Law in Freiburg. She is a Fellow of the Higher Education Academy, and a member of the SLS, SLSA ILA, ESIL and ASIL.